USPA NEWS - Western Societies during the 1950s were Optimistic about the Future. As the Decade progressed, People prospered, buying Cars, moving to the Suburbs, and enjoying many of the Latest Technological Advances. But despite the Success of Many White, Middle-Class Americans, the 1950s was also a Decade marked by Military Buildup and Social and Racial Inequality. Western Societies during the 1950s were Optimistic about the Future. As the Decade progressed, People prospered, buying Cars, moving to the Suburbs, and enjoying many of the Latest Technological Advances. But despite the Success of Many White, Middle-Class Americans, the 1950s was also a Decade marked by Military Buildup and Social and Racial Inequality. Global Organizations like the United Nations become the Foremost Forum to address Issues that Transcend National Boundaries and cannot be resolved by Any One Country acting alone : Africa, Ageing, Aids, Atomic Energy, Big Data, Children, Climate Change, Decolonization, Democracy, Food, Gender Equality, Health, Human Rights, International Law & Justice, Migration, Oceans & the Laws of the Sea, Peace & Security, Population, Refugees, Water. 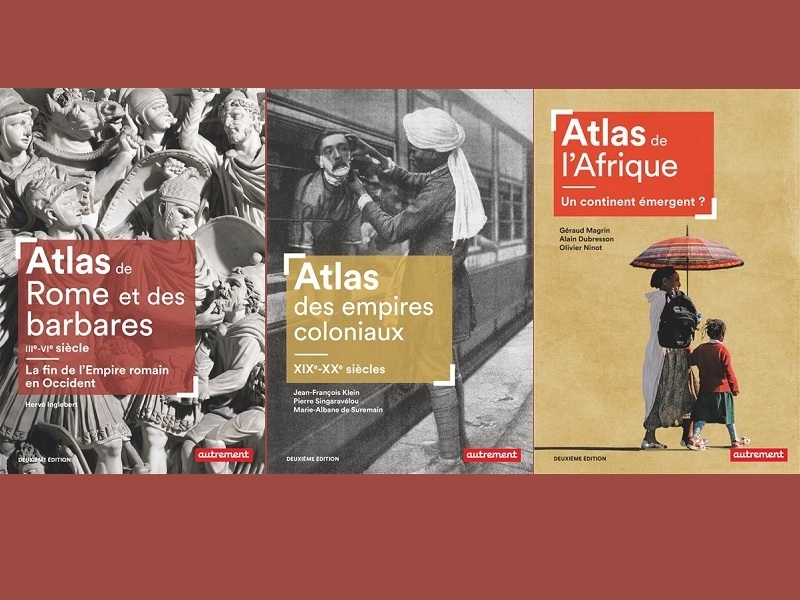 - "Atlas De L'Afrique - Un Continent Emergent ?" (Africa - An Emerging Continent ?) By Gérard MAGRIN, Alain DUBRESSON, Olivier NINOT. Is it really about was is described Today as the Continent's Burgeoning Technology Movement, Rising Entrepreneurs, Groundbreaking Philanthropists, and Cultural Innovators making an Impact in Music, Fashion, and Film ? 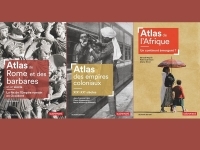 - "Atlas des Empires Coloniaux, XIXème - XXème Siècles" (Atlas of Colonial Empires, XIXth - XXth Centuries) By Jean-François KLEIN, Pierre SINGARAVELOU, Marie-Albane De SUREMAIN. Colonial Empires first emerged with a Race of Exploration between the then most Advanced European Maritime Powers, Portugal being the First One and Castile (Spain) following Suit, during the 15th Century. The Initial Impulse behind these Dispersed Maritime Empires and those that followed was Trade, driven by the New Ideas and the Capitalism that grew out of the European Renaissance. Subsequent Colonial Empires included the French, English, Dutch and Japanese Empires. The British Empire, consolidated during the Period of British Maritime Hegemony in the 19th Century, became the Largest Empire in History by Virtue of the Improved Transportation Technologies of the Time. At its Height, the British Empire covered a Quarter of the Earth's Land Area and comprised a Quarter of its Population. During the New Imperialism, Italy and Germany also built their Colonial Empires in Africa. After the Boxer Rebellion in 1901, Imperial China made Concessions to the Eight-Nation Alliance (all the Great Powers of the Time). By the end of the 20th Century most of the Previous Colonial Empires had been decolonized. The French Colonial Empire constituted the Overseas Colonies, Protectorates and Mandate Territories that came under French Rule from the 16th Century onward. A Distinction is generally made (??) between the "First Colonial Empire," that existed until 1814, by which Time most of it had been Lost, and the "Second Colonial Empire", which began with the Conquest of Algiers in 1830. The Second Colonial Empire came to an End after the Loss in Later Wars of Indochina (1954) and Algeria (1962), and "Relatively Peaceful Decolonizations" Elsewhere after 1960. - "Atlas De Rome Et Des Barbares, IIIème - VIème Siècle - La Fin De l'Empire Romain en Occident" (Atlas of Rome and Barbarians, IIIth - VIth Century - The End of Roman Empire in The West) By Hervé INGLEBERT. Many People ask why the Roman Empire ended. The Fall of Rome is an Example of the Domino Effect. The Fall of the Western Roman Empire is a Great Lesson in Cause and Effect. The Fall of the City of Rome and the Western Empire did not put an End to the Entire Roman Empire. The Eastern Empire survived for Another Thousand Years. The Eastern Empire is Sometimes called the Byzantine Empire, after the Capital City of Byzantium. Greek was the Main Language in the Byzantine Empire, not Latin.... Barbarians (a Word that Today often refers to Uncivilized People or Evil People and their Evil Deeds) originated in Ancient Greece, and it Initially only referred to People who were from Out of Town or did not speak Greek.